I like catching fish, all fish. I prefer big fish, but I absolutely do not discriminate against the dinkers or little fish. I like wild, colorful trout and I like ugly fish. Sometimes, the ugly fish pull the hardest. The ugliness of a fish is highly subjective I understand, but Carp are ugly. However, Carp fishing with a fly rod is a blast and I highly recommend trying it out. This isn’t about Carp though. We’ll make it back to them eventually and briefly, but this is about trout. This is about catching lots of trout consistently, bruisers and dinkers alike. This is about nymphing on streams and rivers, and how competitive fly fishing has evolved and refined nymphing technique to give us modern nymphing, and its place in fly fishing. I can already sense and visualize a few eyerolls from readers after seeing “fly fishing, competitive, and nymphing” in the same sentence. But, the reality of fishing is that most, nearly all, of fish meals come below the surface of the water. That leaves us with nymphing and streamer fishing in the fly world. But, we know that trout don’t always go out of there way to hunt down baitfish or streamers either. If you don’t nymph and fish subsurface, you’ve put yourself at an immediate disadvantage to the fish. Or, perhaps, you’ve put yourself at a disadvantage to your buddy, who is nymphing, in a little wager to see who buys the first round of adult sodas. You might want one of those while reading this. Nymphing catches trout everywhere. Want to catch trout in ponds, lakes, streams, rivers, trickles, and brooks? Nymphing will do it. It catches fish in all seasons and weather conditions. This doesn’t mean start nymphing and catch 83 fish a day spring, summer, fall, and winter. Certainly, slow days happen where bites are hard to come by. There is that whole learning process too… UGH… Learning… But, the idea of modern nymphing is straightforward. Once the concept is learned and understood, it’s a matter of mastering and refining your tools and technique. How is modern nymphing different than… traditional nymphing (we’ll call it that)? Modern nymphing is the outcome of taking European nymphing techniques and combining them to give us something more universal. It’s tight line nymphing. It’s short role casts and it doesn’t have any pretty overhead false casting. There are no heavy, clunky indicators and traditional fly line has no place. Modern nymphing uses ultra-thin lines, very long leaders, brightly colored indicating lines, heavy weighted flies, and, generally, longer and lighter rods. It is using a tight line presentation to maintain direct contact with your fly or flies (often two flies are used at a time, depending on legality of course). Modern nymphing, contact nymphing, tight line nymphing… Call it what you want, but it’s all the same concept. Isn’t this a far cry from the Macleans fly fishing in that book and in that movie with Brad Pitt? It sure is. 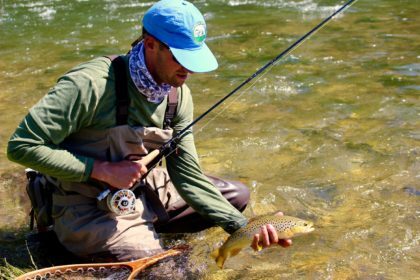 Traditional dry fly fishing and making pretty casts with tight loops has its place. This isn’t a roast on dry fly fishing because it is extremely fun and can be very productive…when there are rising fish. Otherwise, it is kind of the definition of insanity, repeating a process over and over to no avail, but expecting different results. If you’re like me, however, there are days where we set out to do one specific thing and that is all we are going to do. Stubborn is my middle name, as my wife often reminds me, and I find myself trying to force trout to eat dry flies or streamers when they don’t want any part of it. Truth be told, I love standing in a hatch with rising fish. Who doesn’t? I prefer it over nymphing. I love streamer fishing even more. And, there are days, mainly in the spring and fall, that I set out to streamer fish and don’t bring a second rig. I have it in my mind that I am going to catch aggressive trout chasing down a streamer pattern and that’s how it’s going to go! It doesn’t always happen that way… Call me insane and/or stubborn, but I don’t really care. I’m a fly fishing junkie and it’s what I do. Much the same can be said for people who have a deep infatuation for dry fly fishing. Getting back to modern nymphing… This style of fly fishing has been taken from European nymphing techniques. Year after year, the US Fly Fishing Team got their butts’ whipped, by a substantial margin, by Europeans who had been using this style for quite some time. It was time for a change. So, within the last 10 years, maybe 9 or 12 or 15 though (I’m not 100% sure when), members from Team USA started refining techniques they saw. The results have been astounding as they’ve been at or near the top of the leaderboard in the World Fly Fishing Championships in recent years. The technique has caught on with recreation anglers as well, thanks to the growing competitive fly fishing scene. Competitive fly fishing? The rules can get a little complicated, but basically try to catch as many trout as possible on a predetermined section of river (a beat) in a couple hour time limit (a session). The more fish you catch, the better you place. But, that isn’t how fly fishing is supposed to be. Fly fishing isn’t supposed to be competitive. It’s supposed to be enjoyable and relaxing and bring a sense of unity with the surrounding nature and wildlife. Bologna. 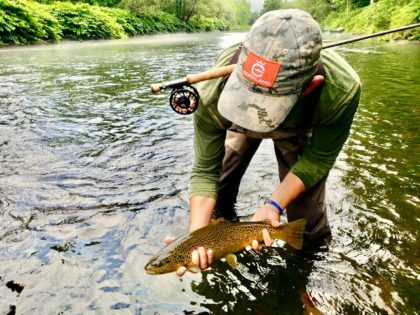 Fly fishing is what you want it to be. There is room for everything. It’s all catch and release fishing. Competitive fly fishing uses barbless hooks and the people involved in the sport have, generally, been fishing for many years and know that care for the fragile fish is of utmost importance. Why can’t competition bring joy to people? It does everywhere else in society. We love competition on the football field. I live and die Yankees baseball. We love watching Syracuse Basketball win. And if they don’t, we are quick to dissect, scrutinize, and criticize every move they make. We compare and score sizes of antlers on deer we shoot. We compare how many banded ducks and geese we’ve shot. I saw on ESPN the other day a rock paper scissors competition. Why? We’re competitive by nature. It’s what drives people to get better and improve. Don’t we all want to be better than the next guy? This is especially true in business. Competitive fly fishing is nothing new anyhow. There have been single and two fly challenges for years. Team USA sanctioned events are a monthly occurrence across the US these days. ESPN hosted the Great Outdoor games and nationally televised an even different format of competitive fly fishing. 2018 marked the 55th year for the Gold Cup Tarpon Tournament. Point being? Competitive fly fishing is not a new, fangled concept. It’s older than many of us reading this rambling. Modern nymphing has become so intertwined in competitive fly fishing because of the high fish counts this technique can produce. What are high fish counts? Devin Olsen, of Team USA, caught 58 fish in a 3-hour session during a recent competition in Idaho. Modern nymphing makes a direct connection with your fly, much like jigging or drop-shotting does with spin gear. Strike detection can be significantly increased because there is no waiting to see and indicator stop, hesitate or go under, which you may miss anyways because of slack line, drag, etc. If you maintain direct contact with your flies as they drift and bounce their way along the stream, and you’re paying close attention and using your sighter (brightly colored section of monofilament, tied in your leader), you know instantaneously that you’ve had a bite. You can feel the knock on the end of the line. You can see the slightest hesitation in your sighter. These are the subtle takes that you would miss bobber lobbin’. Bobber lobbin’ has a place, but day in and day out, tight line nymphing is where I’m at to catch fish consistently. And by no means do I consider myself the best of the best at it. I like to think I’m pretty good at it, but if you want to see the best of the best check out Team USA. A couple of their members, Lance Egan and Devin Olsen, have created some great videos that further explain modern nymphing. This post is long enough. I can’t possibly get into the intricate details of everything today. This would become fourteen times longer. Want to know more? Check out the videos. They are “Modern Nymphing” and “Modern Nymphing Elevated” or chat with us at Upstate Guide Service. Check the site often as we have started to offer some fly fishing clinics. We had a great clinic up to Great Camp Sagamore in July. Be sure to check out Team USA and Fly Comps for the latest info and competition listings. Don’t be afraid to jump in and try one out. I partake from time to time, and the guys are just fly rod junkies and are eager to help someone get on board with the sport. Thinking about diving in? Check out Cortland Line for the latest products in the nymphing industry. These guys are great. Give them a call and they’ll point you in the right direction for rods, lines, leaders, and tippets. You thought I had forgotten… I told you I’d make mention of Carp again. Modern nymphing is effective for everything in the streams and rivers. Carp eat bugs too, as do Steelhead, Smallmouth Bass, Bluegill, Tiger Muskies, and big Brown Trout. Anything that swims in the stream might take that nymph. Hang on tight though and make sure you’re ready for exercise. Those big fish make you work for their picture. If you’ve made it this far, I appreciate you taking the time to read my thoughts and to learn about something new, or old depending on your views and how you see it. At the end of the day, it’s fly fishing. Any way you shape it, it’s a group of like minded individuals in that we all enjoy fly fishing. Modern nymphing, or comp style fishing as I’ve heard it referred to, is just another form to catch trout. Dry fly fishing, stripping streamers, swinging streamers, nymphing, tight line nymphing, skating dries, wet flies… They are all genres of fly fishing. Are some more productive than others at given times and on given days? Absolutely! Modern nymphing catches fish and catches a tremendous amount of fish. Is one better or more noble than the other? That’s for you to decipher. People find excitement and joy in different things. A lot of people love baseball, but not everyone likes the same position. Thanks again for reading. We always welcome thoughts and comments as they drive discussion. Enjoy your weekend and have fun on the water!